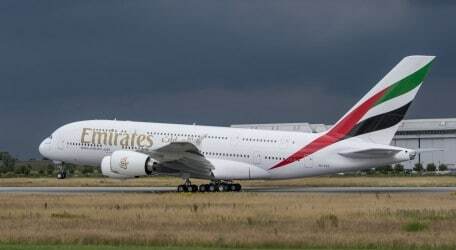 It takes 800 workers just 65 to 80 days to assemble, install, test, paint, furnish and deliver an Emirates Airbus A380, the iconic double-decker aircraft that has been creating headlines and delighting travellers since it first entered into service in 2008. Click here to watch a time lapse video on the making of Emirates’ 50th A380 aircraft which was delivered last month. Emirates operates the world’s largest fleet of A380 aircraft, with 50 of these graceful feats of modern engineering currently serving 29 global destinations. All of Emirates’ A380s have been furnished and delivered via the Airbus facility in Hamburg. First, the aircraft fuselage is produced in Hamburg and then transported to Toulouse for the first stage of final assembly. The wing sections, produced in the UK, are also shipped from Airbus’s Hamburg facility to Toulouse. Parts like the fuselage and wings are transferred through a transportation network that includes three specially-commissioned ships to carry the sections from production sites throughout Europe. Over 10,000 bolts are used to connect the fuselage and over 4,000 for the wings. After assembly, each of the five sections of the fuselage are tested by engineers, and then the aircraft is off to Hamburg for painting and cabin furnishing. It takes 30 people approximately 10 days to paint the A380, which has a surface area of 3,150 square meters – approximately the size of seven professional basketball courts. Over 500 kilogrammes of paint is needed just to give the aircraft its white colour. Cabin furnishing, to install Emirates’ distinctive on-board facilities come in the final stages of the assembly process. It takes about 33 working days to furnish the 550 square metre cabin area on-board the Emirates A380. This includes all seats, galleys, crew rest areas, the unique shower-spa and private suites in First Class, the on-board lounge located at the back of the Business Class cabin, and the award-winning ice inflight entertainment system in all cabins. Emirates received 13 of the giant double decker aircraft in the last year. Over 28 million passengers have travelled on the Emirates A380 over the last six years of operations, and more travellers can look forward to the experience as Emirates adds more A380 destinations to its route network. New A380 destinations planned for this year include: Frankfurt on 1st September, Dallas on 1st October, San Francisco on 1st December and Houston on 3rd December.